Daily Mirror - Proposal to storm Diyawanna shot down! Proposal to storm Diyawanna shot down! 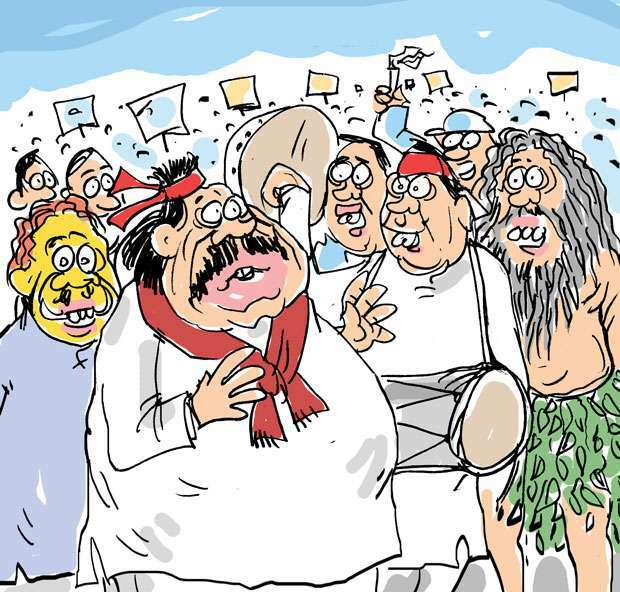 There was a secret powwow chaired by the former strongman convened to finalize the plan for the September 5 ‘Janabalaya’ protest. Only the JO front-liners attended this meeting. They held a lengthy discussion on the cultural highlights and the entertainment items which should feature the demonstration to make it an unprecedentedly colourful and interesting event. The participants who had handled the various aspects of the big event confirmed the readiness of all entertainment items like Virudu, Baila and songs and cultural highlights like Yaga and Thovil dancing, Daha-ata Paliya from the South, Angam-pora from Kalutara and Kirikoraha ritual dance from Mahiyangana. A well-tempered politico, the former strongman did not take kindly to this proposal. However, the heavyweight from the South insisted that it was a good chance to show their strength, which they should not let slip through their fingers. However, the former strongman with a derisive smile addressed the big gun from the South. The discussion ended with this reply by their boss.